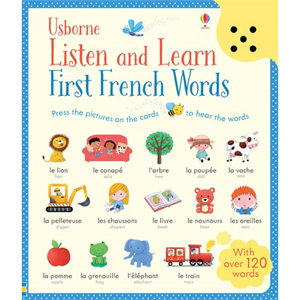 Usborne Listen and Learn First French Words is a fun, interactive tool that will allow children to learn and listen to over 100 everyday French words spoken by a native speaker. Children will enjoy choosing one of the four double-sided illustrated topic cards and slotting it into the book’s special frame Each topic features sixteen words with colourful corresponding pictures; children press an illustration to hear the word read aloud. 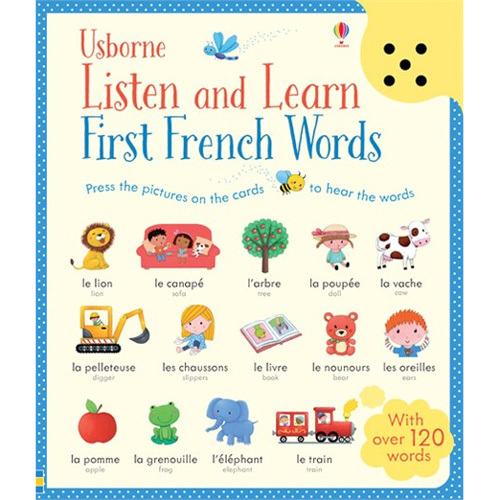 Usborne Listen and Learn First French Words is fun for young children to learn French as either a first or second language. It is aimed at ages 2 - 5 years.